Oriel windows are a type of bay window, but with a few exceptions. These windows are thought to have originated during the middle ages. Their origins can be traced back to both the European and Middle Eastern regions. The word oriel comes from the Medieval Latin word ‘oriolum’, meaning porch or gallery. Corbels support the oriel window sash and add a distinct beauty to the look of your home. The word corbel comes from the Latin word ‘corvus’. Corvus loosely translates to ‘a large black bird’, perhaps a raven. Since oriel windows are often found on upper floors, the corbels may have been mistaken for a flock of birds. Installing modern oriel windows is a great way to add value to your home. If you ever decide to sell your home, these windows will definitely make a great selling point. But they can also provide tons of light, and create a cozy space for relaxing with a beautiful view. 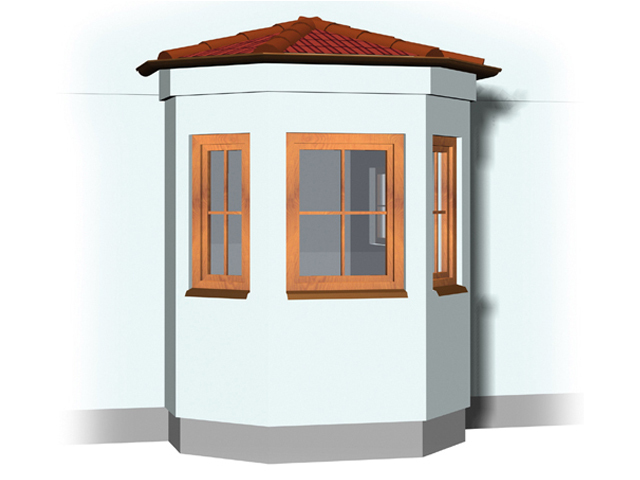 Oriel windows are a great choice if you are working with a smaller home too. These windows create the illusion of a much larger space. Homeowners love the architectural beauty and incredible detail they add to your home. There are plenty of oriel window manufacturers to choose from. It’s essential to consider your options carefully and choose wisely. Research your potential manufacturers and get an idea of how well their products performs in your area. Keep in mind – you get what you pay for. Installing or replacing the windows may be one of the larger investments you make in your home. You want to make sure your new oriel windows are durable, reliable, and offer superior performance. These windows aren’t a common product so companies may not advertise that they carry them . Be sure to ask your potential contractor. The cost to install oriel windows in your home can be difficult to estimate. The extra materials, added features, and labor needed for these windows add to their cost. Your oriel window manufacturer can custom make your windows to ensure the perfect fit. Of course, this will add to your cost as well. Before you start your project, you should contact a few local contractors. This is a great way to get a more accurate cost for installing new oriel windows in your home. Most reputable professionals will be happy to offer detailed estimates at no charge. Keep in mind that your installation costs can vary due to a number of reasons. There aren’t many disadvantages to oriel window installation. The only real downside for homeowners is the initial cost of oriel windows. They can be expensive. In most cases, the added value oriel windows bring to your home and the added benefits make it worth the higher cost. If you are concerned about maintenance, these are fairly easy to take care of. Once or twice a year you should use a non-abrasive cleaner and wipe down the frames. This will keep them in good shape and add to their lifespan. Of course, you’ll want to keep the glass clean as well. This will let you enjoy your beautiful new view for decades.